... which translates to "Chocolate Rice Pudding with Dried Fish." 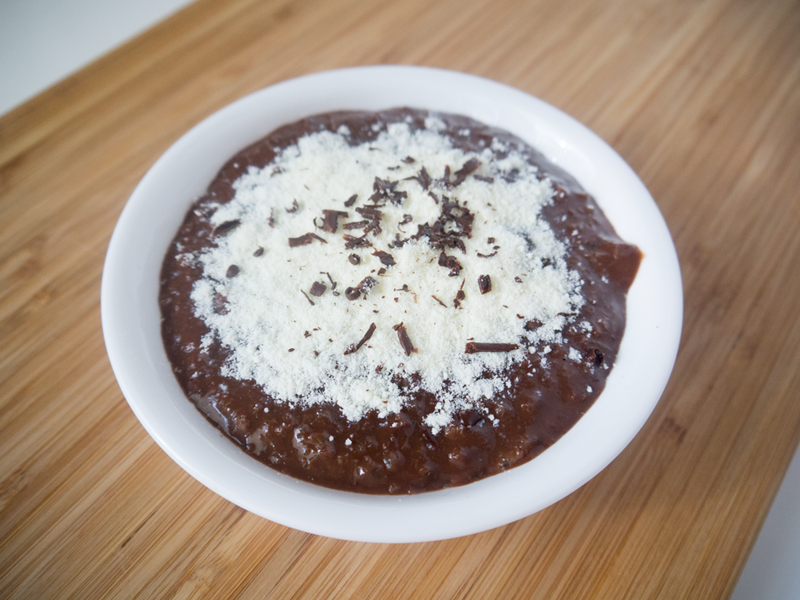 Champorado is a classic Filipino breakfast dish traditionally made with tablea: cacao tablets made with ground cacao beans. 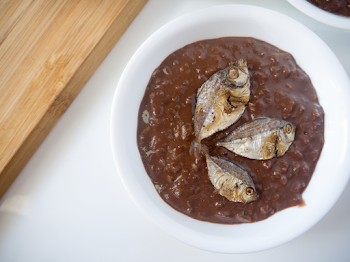 A topping of crunchy fried dilis (anchovies) or tuyo (dried fish) usually accompanies champorado for a sweet-salty flavor contrast. Bulad is the Waray-waray word for tuyo and Waray-waray is one of the dialects Filipinos from the Leyte-Samar area of the Philippines speak. I'm from Tacloban City, Leyte and I speak Waray-waray every time I possibly can. :) Bulad translates to "sun-dried." So there you go, word of the day is "bulad." We used to have a cacao tree in Tacloban and my dad made tablea from the fruits' seeds. It was kind of a family activity. We snacked on the seeds when we were kids. Kakaw, we called it. We sucked (can't find a more appropriate word, sorry) on the seeds' fleshy outsides and they tasted sweet and kind of sour, much like guyabano I think. The seeds would then be left to dry in the sun. As we got older, we skipped the snacking/sucking part and just let the seeds dry straight out of the fruit. We steered away from store-bought tablea simply because we could make it ourselves. The dried seeds would then be dry-roasted - my dad roasted them in the biggest frying pan we had. After roasting, the family activity began. We all had to remove the seed coat from all the seeds to reveal the cacao beans. This step always left my fingernails feeling like they're about to come off. The cacao beans are then brought to the local talipapa (wet market) so they could be ground into what I would call the tablea paste. We would then roll the paste into small balls, place them in the fridge to set, and then distribute some to close friends. This has to be the most authentic, straight-from-the-tree chocolate experience one could ever have. We used our homemade tablea for tsokolate (hot chocolate, my favorite!) and of course champorado. The tablea wouldn't last long, one month at the most. And then we'd have to wait for the tree to bear fruit again, 6 months to a year. Fast-forward to current times: our cacao tree had died, I moved to the States, and there is no tablea to be found (here in our area anyway). I've seen Mexican chocolate tablets in grocery stores but I don't know if they're the same. Anyway, I get champorado cravings all the time and it's a good thing I found a very easy recipe. It's not authentic nor is it made with tablea but it gets the job done and more importantly, it tastes like home. 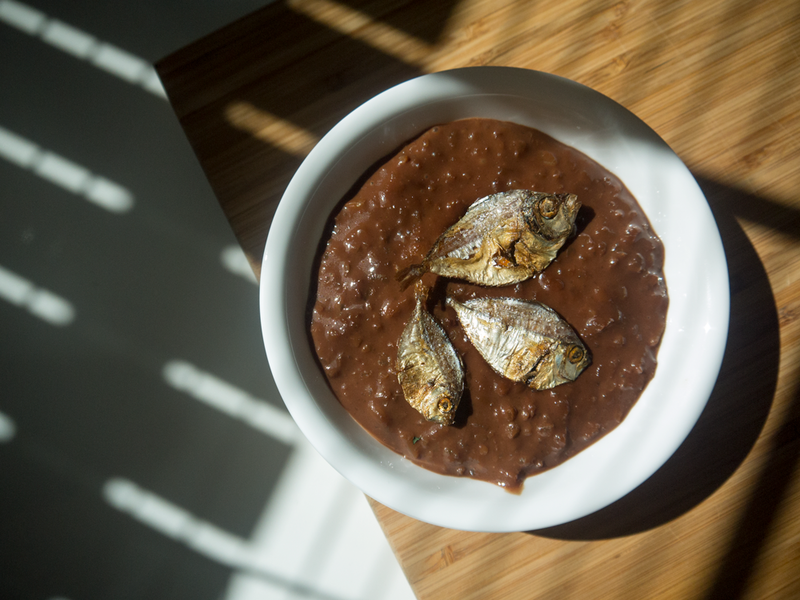 If you don't like dried fish on your champorado, you can drizzle it with evaporated milk as is usual in most restaurants in the Philippines. If you are like my husband, spoon some powdered milk (we use Nido) onto your rice porridge. Powdered milk was very popular when we were kids (maybe it still is, I don't know) so this is kind of a childhood thing. I tried sprinkling flaky sea salt on my champorado (pa-sosyal effect, salted champorado) and it tasted quite nice actually, try it. Double Boiler method: Create a double boiler by filling a pot with 2 inches of water and bringing it to a simmer over medium-low heat. Place the chocolate in a heatproof bowl and set it over the pot. (Do not let the water touch the bottom of the bowl.) Stir continuously until the chocolate is completely melted and smooth. Remove from the heat and set aside. Microwave method: Place the chocolate in a microwave safe bowl and microwave in 30-second intervals until melted. Make sure you stir the chocolate after every interval, returning it in the microwave ONLY IF big chunks of chocolate still remain even after stirring thoroughly. Be careful not to "break" the chocolate wherein the cocoa butter already separated from the chocolate. 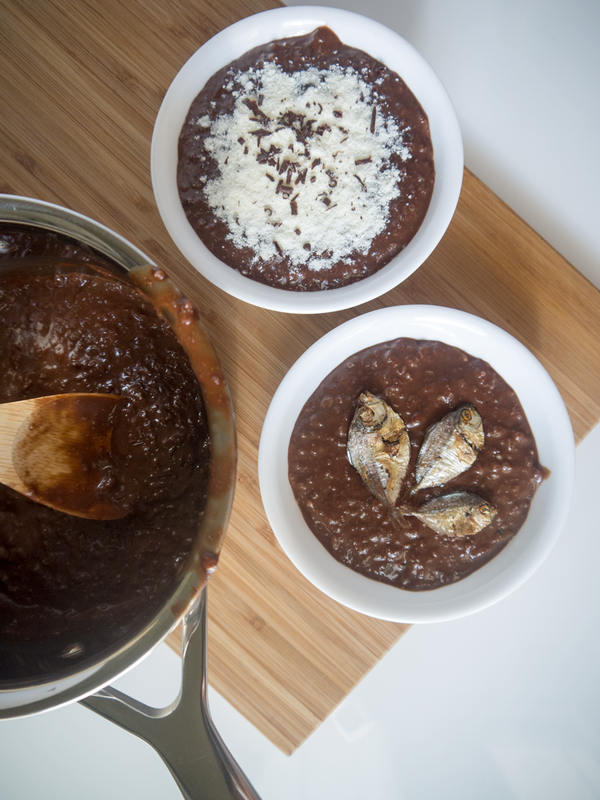 Spoon the champorado into serving bowls and drizzle each with evaporated milk or top it with powdered milk or dried fish, if you like.